The US Army Corps of Engineers developed it as a land management and environmental planning tool. Now, academics, government agencies (NASA, NOAA, USDA and USGS) and GIS practitioners use this open source software because its code can be inspected and tailored to their needs. But what about for the every day GIS user? 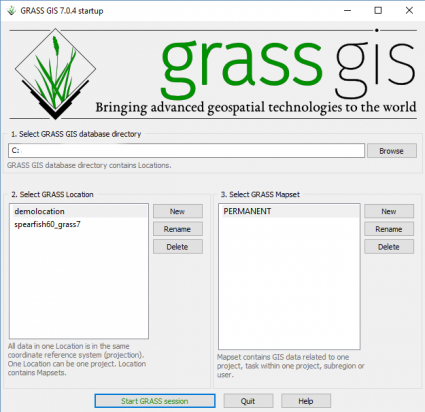 Here’s how to download GRASS GIS. Now, let’s take a look at what you can do with it. Traditionally, users have all their data stored all over the place… their local drives, network drives and external ports. While ArcGIS and QGIS will project your data on the fly, GRASS GIS insists that data in different projections be placed into separate folder locations. For quality reasons, GRASS GIS handles one projection per folder location. This is mostly because a lot of users out there tend to ignore their coordinate systems and simply assumes their data lines up. Case in point, you will have to be more cautious with your data’s coordinate system in a GRASS Workspace File (*.gxw). Here’s the good news: GRASS GIS is loaded with 99% of the analysis tools you need in everyday life. Without a doubt, this software has some serious firepower with over 400 raster and vector manipulation tools. It has so much in its arsenal that QGIS and uDig have adopted it as a base analysis set of tools of their own. Raster, vector, imagery, 3D raster and temporal tools are at your disposal. Some of my stand-outs included the satellite imagery tools (atmospheric correction, DN conversion and vegetation indices). Also notable are the modelling tools for groundwater, wildfire, hydrology and landscape patch analysis. 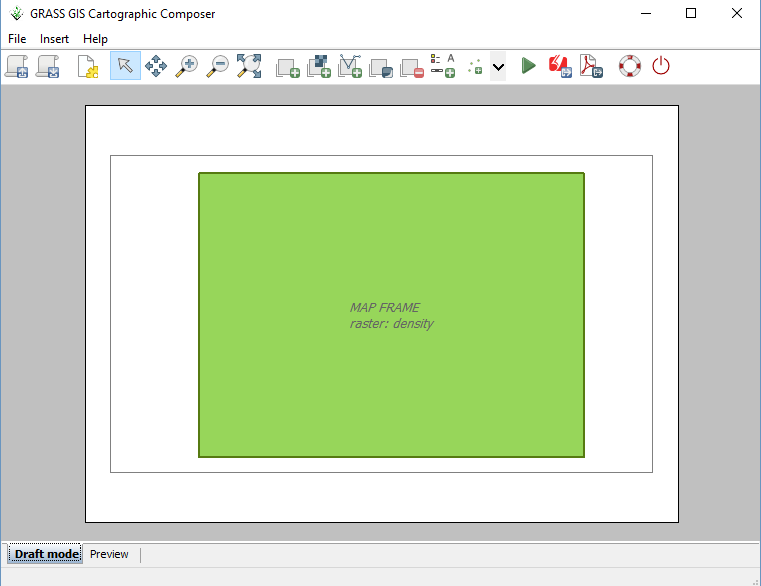 Does GRASS GIS have the sophisticated analysis tools for almost any type of analysis? You bet it does. …And a ridiculous amount of options to tweak. Now, here’s the bad news: GRASS GIS is probably not suited for 99% of your mapping you need in everyday life. The GRASS GIS Cartographic Composer is meant to interactively design and generate hard copy maps. Start by creating a map frame. From there, you can add your raster or vector data. Add map elements like a legend, map info, scale bar, text, image or north arrow. Finally, export your map as a PDF or PostScript output. The preview didn’t work. But when you export a PDF – it actually worked. Selecting a different map arrow gave me the ‘unable to read file’ error. The map frame is rigidly controlled to that aspect once created. A cartography nightmare is a bit of an exaggeration. But I can tell you that cartographers are not dreaming of working with GRASS GIS for their masterpiece. The 3D capabilities are surprisingly impressive. It’s integrated within the map display and all you have to do is select the 3D drop down. Choose the lighting, perspective, tilt… It’s really quite good. GRASS GIS can also set up vector networks with some topology maintenance. The network analysis tool includes shortest path, moving-salesman, maximum flow and center allocation. Lastly, the documentation is superb. The GRASS manual details the use of modules distributed with Geographic Resources Analysis Support System (GRASS). 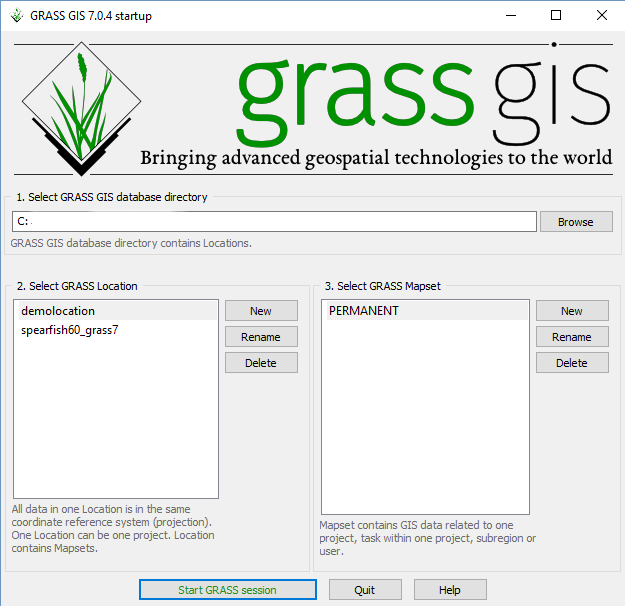 GRASS GIS is set up differently than other GIS software. While I hesitate to deem it a non user-friendly application, there are people who have become accustomed to all its quirks. The original user interface of GRASS was in command line only. It’s come a long way to provide a GUI to the public – especially in the last decade or so. … But if you’re coming from the world of ArcGIS or QGIS, this won’t be something you can just pick up at the drop of a hat. Academic circles love GRASS GIS for its scientific tools, extensive documentation and its proven track record. The brilliant engineers at the US Army Corps of Engineers designed a ridiculous powerful set of open source scientific tools. It’s sleek. It’s an all American style of GIS. While out on their lunch break, some one snuck in and programmed in a clunky GUI, odd coordinate folder system and error-prone cartographic composer so you won’t be able to craft the maps you want to. With that said, it’s free and open source. And you certainly can get the job done. It just takes practice to master. What are your thoughts? Let the adventure begin with GRASS GIS? Why Are Great Circles the Shortest Flight Path? It’s totally true: long life to GRASS GIS! GRASS GIS is incredibly efficient esp. for raster data and extremly reliable. Which tells you much more about GRASS than I could write in a review here. The command line in the background is actually a big plus and also the data management and CRS handling is brilliant, esp. in multi-user environments. Exactly because people otherwise usually have their data “all over the place”, floating around everywhere so things become a real mess and users way to often are unmindful regarding CRS. Cartography is indeed not the big strength of GRASS (and rather focused on the most important things), but calling it “unsuitable” is unobjective. What is suitable depends on the purpose! The temporal framework in GRASS should be mentioned as an exceptional standout. If you are after black boxes which (seemingly) do the thinking for you, GRASS is probably not the GIS of your choice. But if you like control and efficient workflows in analysis I cannot think of any better! P.S. : I understand that the style of writing in the review is meant to be flippant, but I cannot help it but finding some passages just inept, sorry.